Today I'm sharing two cards I made using the Timeless Tidings stamp set. When I purchased this set, it expected to use it with the amazing Timeless Tidings Project Kit, but I really like the sentiments and small images that are in the set. It's a very versatile set for the Holiday Season. First a card that I CASE'd (Copy and Share Everything) from Pinterest. I'm really sorry, but I can't remember who's card this is. If it's yours, let me know and I'm happy to give you credit. I love the look of Shaded Spruce and Real Red together! This is an easy card to make. If you don't have Stitched Shapes Framelits, you can cut out squares for the images and backgrounds. I used a Dimensional to pop up each of the images and added a Red Rhinestone to give it some bling! 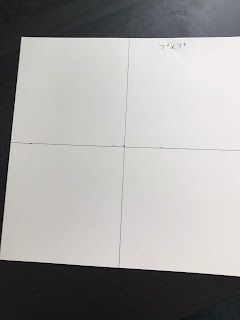 Cut one piece of 7"x 7" white card stock (c/s) and draw a line down the centre in both directions. 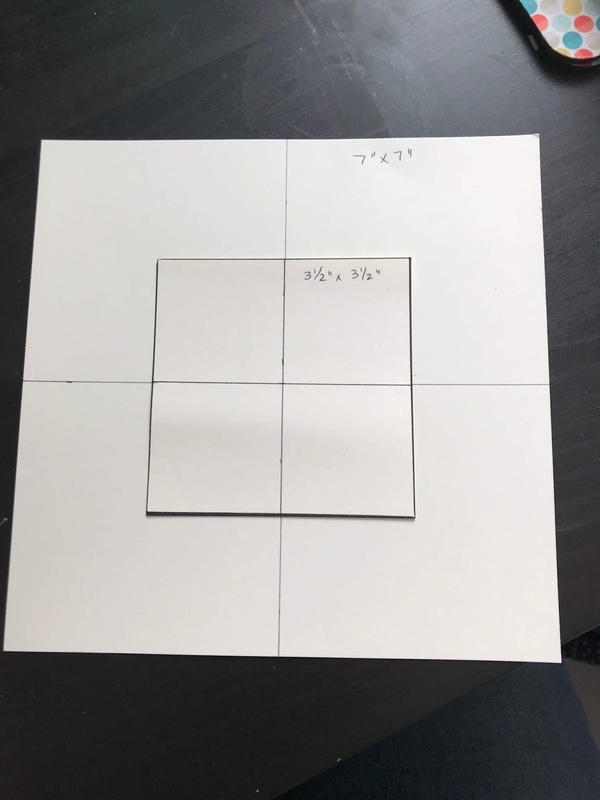 Cut one piece of 7"x 7" acetate and lay it on top of the white cardstock. 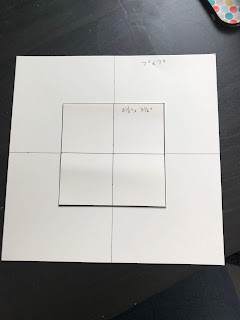 Lay the 3 1/2" square on top of the 7" square like you see in the picture. 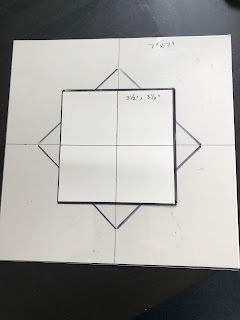 Use a permanent black marker to draw a line around the 3 1/2" square onto the acetate. Again, take the permanent black marker and draw a line around the square. 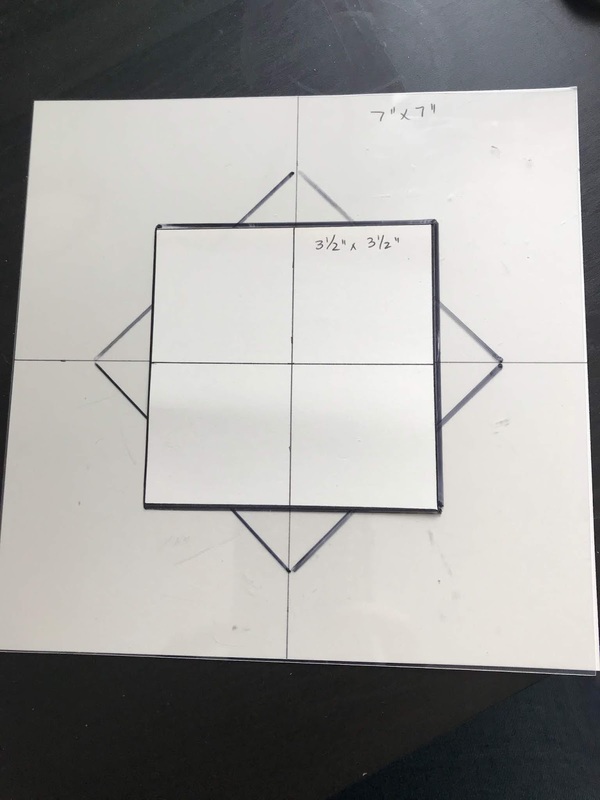 Place a clean 3 1/2" white square into the centre of the square and you are ready to stamp! 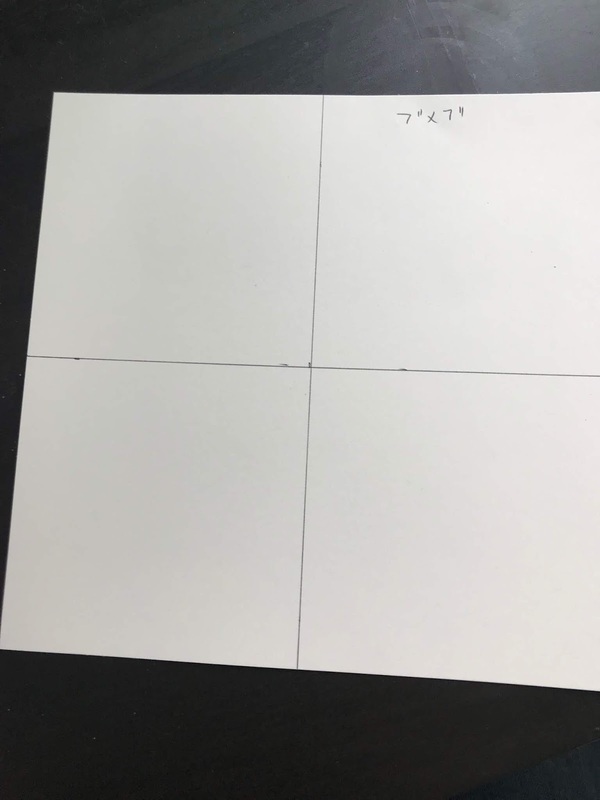 After stamping the first image, rotate the 3 1/2" white card stock so that now the points are lined up diagonally. For this card, I used the poinsettia image to create my wreath. I stamped it 8 times around the circle using Tuxedo Memento Black Ink. Then I coloured using the Dark Cherry Cobbler Stampin' Blends. I stamped the Merry Christmas sentiment in the middle of the wreath. I thought that I should have stamped in VersaMark and embossed in Gold after I finished the card - it would have really popped the sentiment. Maybe you can try that at home and share your creations! 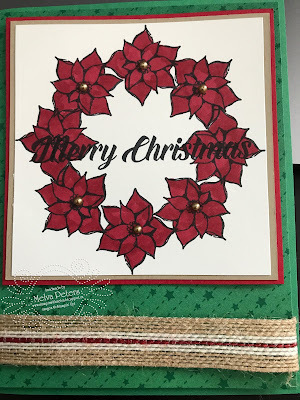 To finish the card I mounted on Crumb Cake and Cherry Cobbler card stock and popped up on a piece of All is Bright Designer Series Paper and then finally on a Call Me Clover card base. A piece of Striped Burlap Trim and some Gold Pearls finished off the card! This is a great way to use your Stamparatus! You can create amazing wreaths out of any small image! I'm so excited to see your cards Leave a comment with a picture of your creation (doesn't have to be Christmas) and I'll draw for a prize on October 1st! As a thank you for orders over $50, I'll send you 4 FREE cards and instructions by mail to thank you. when you order online using the Hostess Code. If your order is over $200, please do not use the Hostess Code as you'll qualify for Stampin' Rewards, but I'll still send you the 4 free cards! Don't forget, that orders over $300 earn a free package of Dashing Along Designer Series Paper until the end of September!